Incandescent light bulbs for sale in 2012. That year China unveiled its plan for phasing out the energy-inefficient incandescent light bulbs in an attempt to promote energy conservation and emissions reduction. 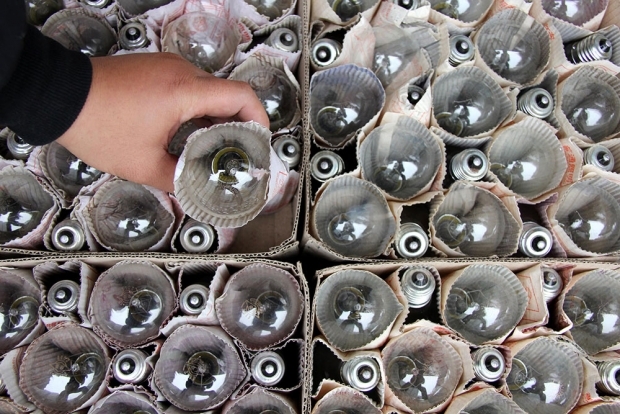 Imports and sales of 100-watt-and-higher incandescent light bulbs will be banned as of October 1, 2012. This article first appeared in chinadialogue. China has mapped out how it will try and peak greenhouse emissions by 2030 or before, details that could have a major bearing on U.N. climate talks aimed at delivering a deal in Paris later this year. The world’s largest emitter of greenhouse gases “will work hard” to peak its CO2 emissions before 2030, Premier Li Keqiang said at a summit meeting with the French government in Paris ahead of the climate plan’s publication in Beijing and submission to the U.N.’s climate arm. The document said China plans to reduce the carbon intensity of its economy 60-65 percent per unit of GDP by 2030, compared with 2005 levels, and reiterated a previously-announced aim that renewables should make up 20 percent of its primary energy supply by the same date. It added that to reach its 2030 goals, China would need to build on actions already taken by introducing new, toughly-enforced laws and penalties and hasten sweeping changes to how it produces and consumes energy, goods, and raw materials. China has already achieved a 33.8 percent cut in carbon intensity on 2005 levels but details of the climate plan released today provide few clues on how fast emissions will fall after an emissions peak. Analysts pointed out that the 60-65 percent goal on cutting carbon intensity represented a major increase from previous commitments, but the rate at which emissions still rise, peak, and then fall would be largely dependent on what happens to GDP in China. “It will be interesting to see if China clarifies this further,” said Mark Kenber of the Climate Group. Other analysts said the 60-65 percent carbon intensity target reflected the advances already made by China to decarbonize its economy. “Meeting this goal won’t be easy, but research shows that with a sustained commitment China can reach its target even before 2030. This commitment will benefit China and represents a serious and credible contribution to tackle climate change,” said Jennifer Morgan of the World Resources Institute. However, Li Shuo of Greenpeace China said the targets outlined in the INDC were at the less ambitious end of the scale of what is possible in China. Policies and targets that have already been announced, including last year’s promise to peak greenhouse gas emissions by 2030, make up much of the document submitted to the U.N., known in official jargon as an Intended Nationally Determined Contribution (INDC). In it, China highlights an unprecedented roll-out of renewable energy and energy efficiency measures, shutdowns of coal-fired power plants and energy-guzzling factories, and a switch to cleaner-burning gas. Even though much of China’s climate plan is made up of previously-announced policies related to energy use, it means the world’s three highest emitting economies—China, the U.S., and the E.U.—have published the climate action targets they are prepared to commit to under a new agreement reached in Paris. But the document said little on the pathway for emissions cuts after 2030 and whether the country can, or will, drive down its emissions at a rate that would help the world avoid runaway climate change. China has so far rejected proposals by the E.U. to review emissions cuts every five years. Commentators have also pointed out that China’s action on climate change is driven by genuine self-interest and is part of the government’s reform agenda, outlined in the Five-Year Plan, to restructure the Chinese economy, and address concerns about air pollution, energy security, and the adverse impacts of climate change. Based on the 20 percent non-fossil fuel commitment in the INDC, China will have to build an additional 800-1,000 GW of zero-emission generation capacity by 2030—about the same as the country’s current coal-fired capacity and nearly as much as the total current installed capacity in the U.S. energy sector. Meeting climate reduction goals in the INDC will cost China over $6.6 trillion (41 trillion yuan), the country’s lead negotiator at U.N. climate talks said last week at a meeting with U.S. counterparts. This would involve heavy costs for energy-intensive industries, but could also provide huge economic benefits to sectors such as renewables, energy efficient equipment, environmental technologies, low-carbon vehicles, and power grid infrastructure. Following the publication of the INDC, other large emitters such as the U.S. and the E.U. are likely to crank up the pressure on China to set up a robust rules-based system through common international accounting rules and reporting requirements, something that the central government in Beijing has rejected so far.